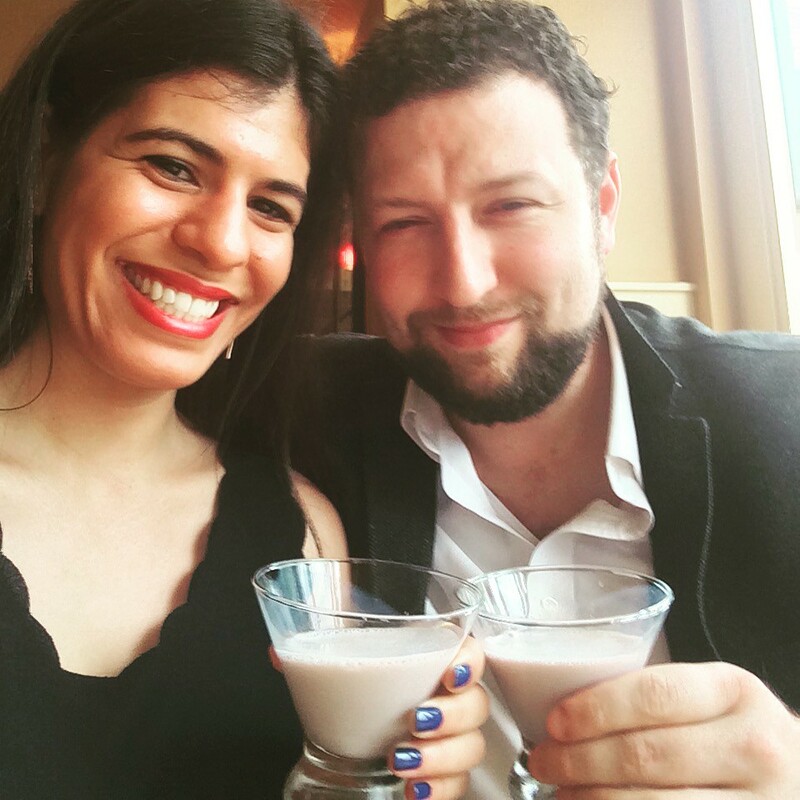 Last week I was invited to cocktail and food pairing event with the new (and first of it's kind) Indian cream liqueur, SomruS. The name translates to "Nectar of Gods" and is commonly used as a slang term for alcohol in India. The creators of the unique drink wanted to introduce a flavor pallet that would pair well with Asian cuisines and based it off one of the most popular Indian desserts, Ras Malai. 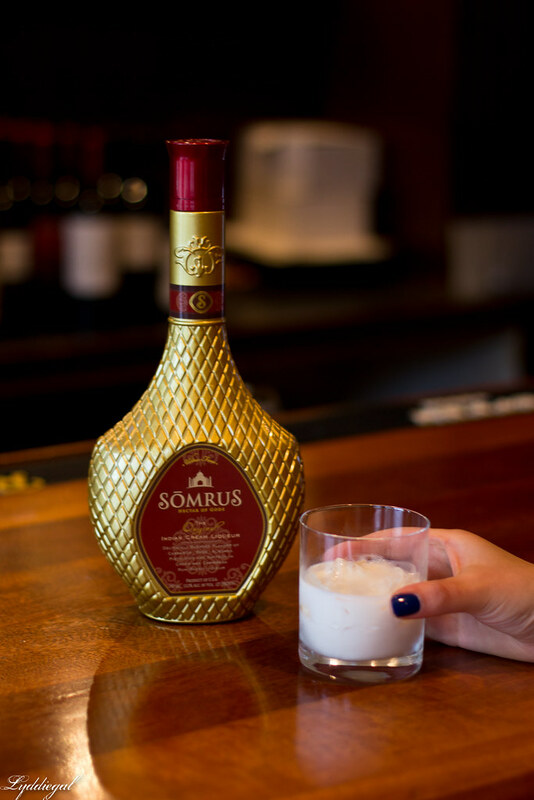 Pistachios, almonds, cardamon, and saffron bring a unique spice pallet to SomruS which sets it apart from any other cream liqueur on the market. SomruS started its US launch in October and is just being released in Connecticut this month. It's been a busy eight months for SomruS, and its had an outstanding reception, gaining four well deserved awards. 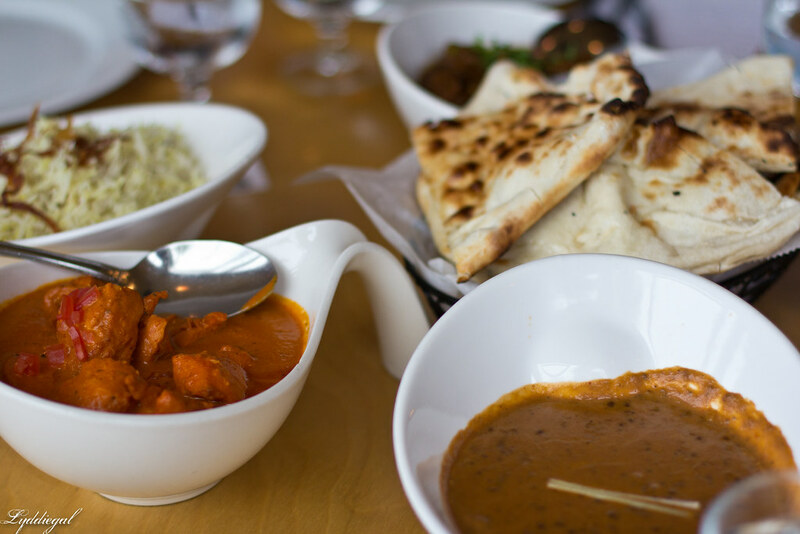 For the event, I was invited to the Indian restaurant Thali in New Haven, along with other local bloggers, and I was delighted to have a plus one on my invite, which meant Sean got to attend his first blogger event! 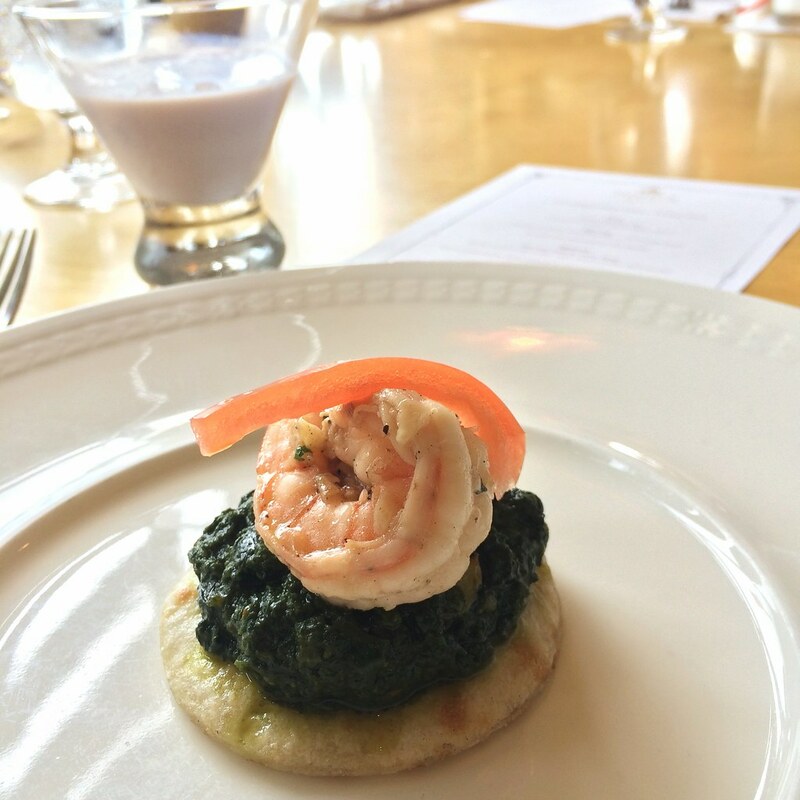 SomruS and Thali created a satisfying menu to showcase the versatility of SomruS, and how well it pairs with the complex spice pallet of Indian food. SomruS on the rocks is quite delightful, it's sweet, a little savory, and perfectly crafted to leave no alcohol burn. Mixing it up only enhances the drink - my favorite pairing was the second course, SomruS with Chambord and Green Chartreuse, which really elevated the spice of the drink and it worked perfectly with the flavor of the Indian-style spinach. 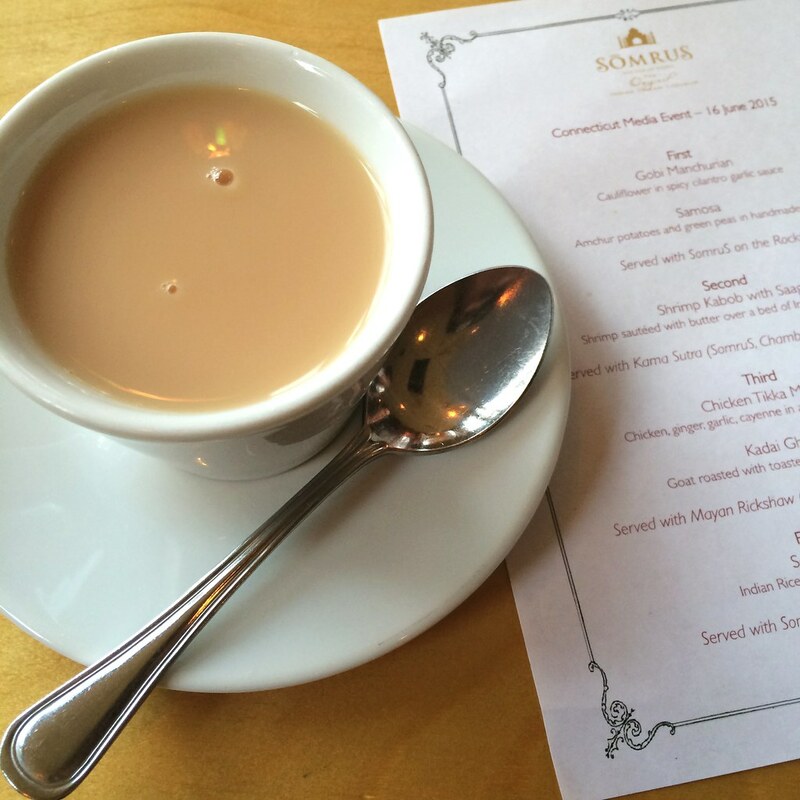 For me the other mixed drink highlight was the SomruS chai tea with the dessert course of SomKheer. While I'm not normally one for hot alcoholic beverages, this combination worked really well - and would also be amazing iced too! The creators of SomruS are really excited about the possibilities and pairings for this drink, and some suggestions that I can't wait to try include SomruS over ice cream, in Thai iced tea, in a mango lassi, and in a cheese cake! I'm already following their Pinterest so I can check out new recipes as they are added. A huge thank you to SomruS and Thali for putting on such a lovely event! SomruS invited me to this event for the purpose of this post. My views and opinions are my own. that meal looked so yummy! And I LOVE your scalloped top and jacket!! So chic! I saw your photos from this event on instagram and I have to admit, I was really intrigued. 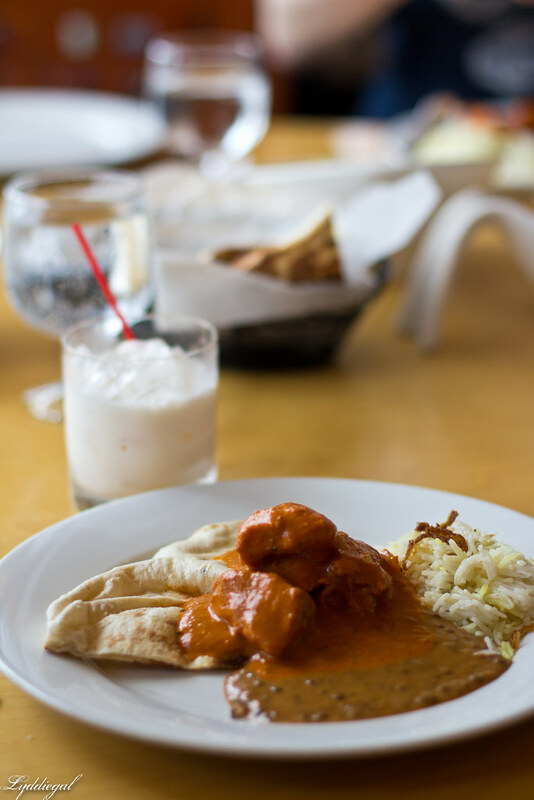 I love Indian food - in fact, I'm really craving Indian takeout after seeing these photos ;) - and I love chai-spiced anything even more. I'm sure it will be a while before SomruS is released in Canada, but when it is, I'm absolutely going to try it. Also, can we talk about how you are rocking a cropped top with shorts? This is such an amazing summer night out look and you have me seriously thinking I need to add a summer crop top to my wardrobe to go with the winter one that I already have. Now that is the right way to do a crop top. Your jacket and crop top are amazing. You were a hot date and that food looks and sounds yummy good! You look awesome! I'm so bummed I couldn't make it... Everything looks amazing, will def pop in when in town! This looks so fun. 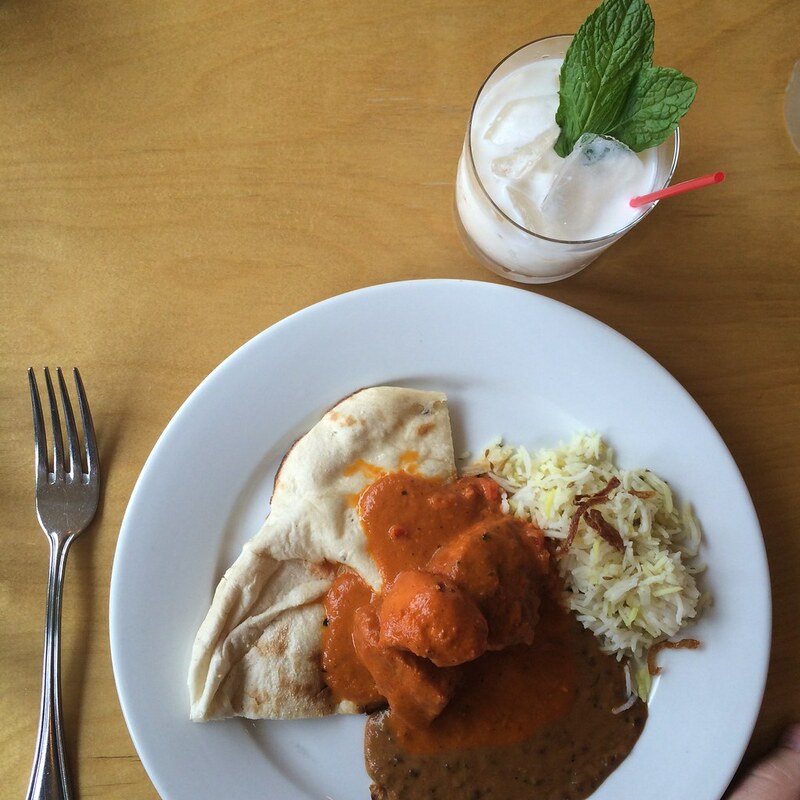 Now I am craving Indian food and a fun date night. Love your matching separates look. The chai tea mixed drink sounds delicious! I love Indian food. What a great date night look too! YUM! I love indian food! I love this look! The top and shorts look perfect together and I love the pretty jacket too! 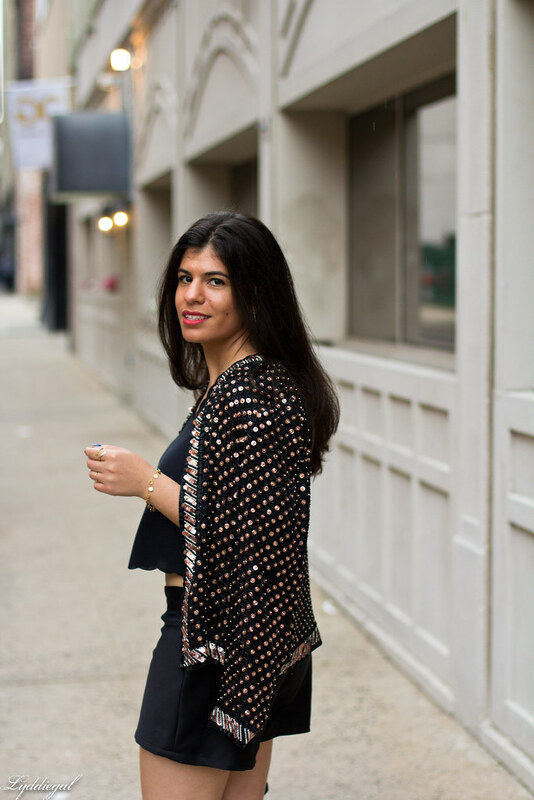 Um...this sequin sweater is unreal!! this event looks like so much fun and i love the scalloped hem of that top! In love with your jacket! You look so pretty in this look! Oh my gosh...the food looks amazing and so does the drink! How fun that you were able to bring a plus one! It's not as fun going to blogger events by yourself. I also LOVE your outfit. 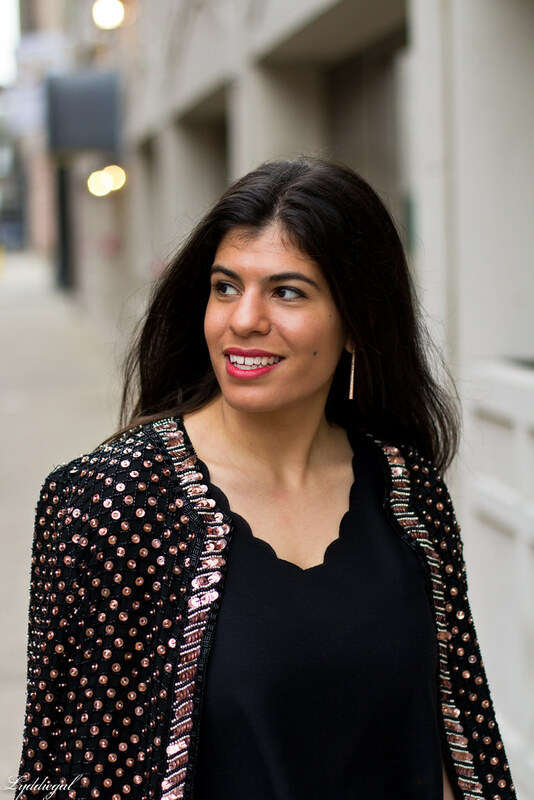 That beaded jacket is amazing! Looks like a fun date night! 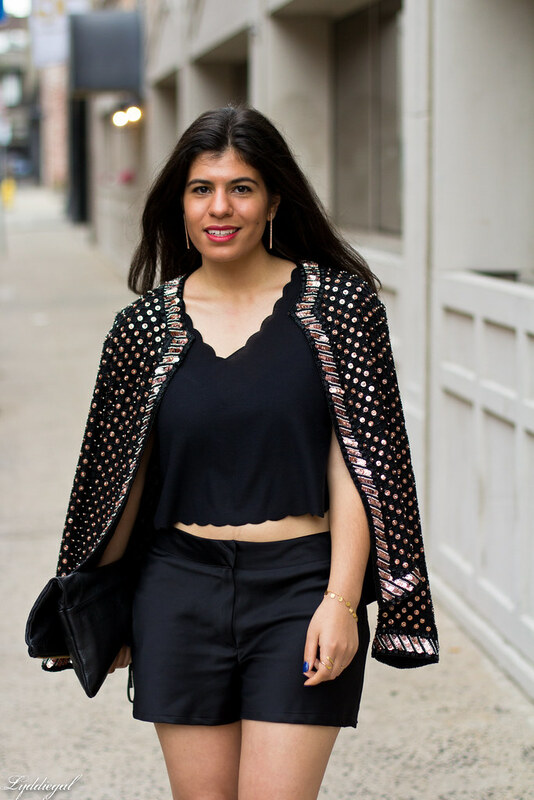 I love this outfit on you, a beautiful crop top with a gorgeous jacket! Looks like an amazing event! The food looks delicious! That thrifted jacket might be the best thrifted find I have seen in a long time. You look amazing! Ooh that sounds so good!! 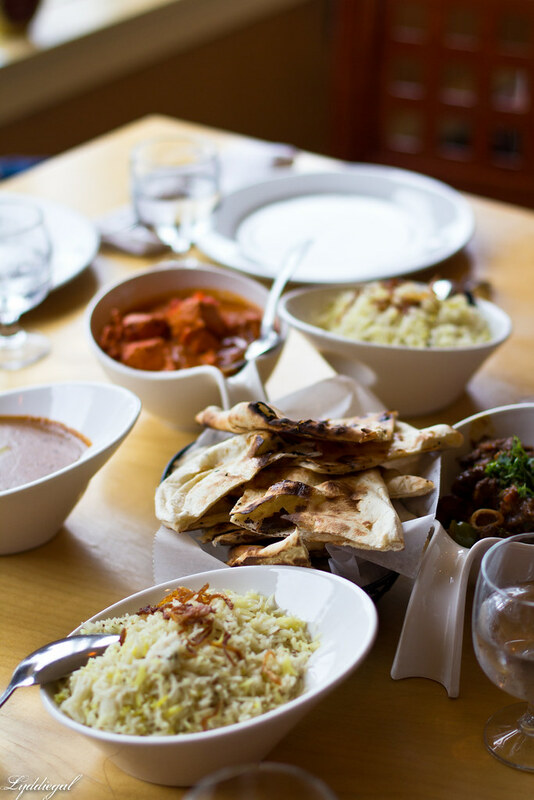 My mouth is watering over the Indian spread too... YUM. Love the your look for this event too, that sequin jacket is awesome! You look so good in these shorts and scalloped outfit - how fun that he got to attend and also take your pictures!